OTTAWA, June 1, 2018 /CNW/ - The Prime Minister, Justin Trudeau, announced that the Governor General appointed Mohamed-Iqbal Ravalia as an independent Senator to fill a vacancy in Newfoundland and Labrador. The P.M. stated, "I am pleased to welcome Parliament's newest independent Senator, Mohamed-Iqbal Ravalia. Dr. Ravalia's vast knowledge and experience have earned him high respect in the medical field, and I am confident that he will be a great ambassador in the Senate, not just for Newfoundland and Labrador, but for all of Canada." Dr. Ravalia is a community leader, family physician, and senior medical officer at the Notre Dame Bay Memorial Health Centre in Newfoundland and Labrador. He is also an Associate Professor of Family Medicine and the Assistant Dean of Rural Medical Education Network at Memorial University. Dr. Ravalia was recommended by the Independent Advisory Board for Senate Appointments and chosen using the merit-based process open to all Canadians. This process ensures Senators are independent, reflect Canada's diversity, and are able to tackle the broad range of challenges and opportunities facing the country. Dr. Mohamed-Iqbal Ravalia is a physician, mentor, and community leader in Twillingate, Newfoundland and Labrador. Dr. Ravalia holds a Bachelor of Medicine and Bachelor of Surgery from the University of Rhodesia, in present-day Zimbabwe. Dr. Ravalia overcame the apartheid in Zimbabwe and found the community environment he was missing in his native country in rural Newfoundland and Labrador. His deep appreciation for the province, its landscape, and its people comes from his unique experience as an immigrant. Dr. Ravalia is currently a family physician, as well as a Senior Medical Officer at the Notre Dame Bay Memorial Health Centre. He is also an Associate Professor of Family Medicine and the Assistant Dean of Rural Medical Education Network at Memorial University of Newfoundland. He is a member of many medical organizations, including the Medical Council of Canada NAC3 Committee, the College of Physicians and Surgeons of Newfoundland and Labrador, the Association of Faculties of Medicine of Canada, and the Atlantic Provinces Medical Peer Review. He is also a representative to the Group on Regional Medical Campuses. Due to his expertise, he was also consulted on the Primary Health Care Framework for Newfoundland and Labrador. Beyond his professional commitments, Dr. Ravalia is also an active member of his community who worked throughout his career to reach marginalized peoples and communities. Dr. Ravalia has been recognized for his dedication to the medical field and his contribution to rural medicine in Newfoundland and Labrador. He has been awarded the Canadian Family Physician of the Year Award and received the Order of Canada. 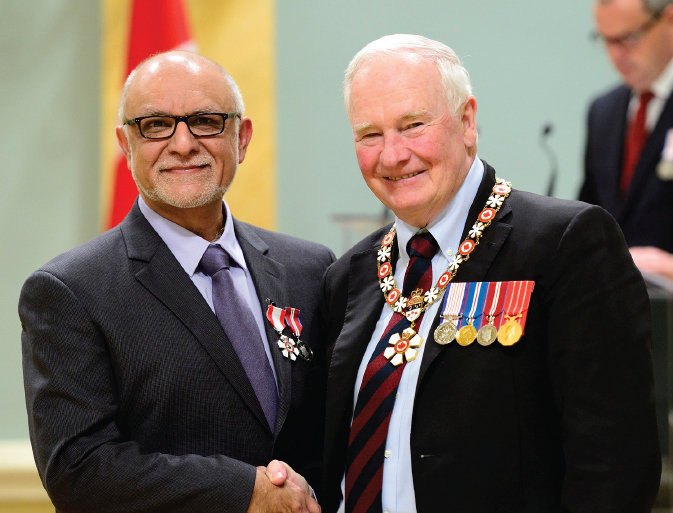 In 2012, Dr. Ravalia was awarded the Queen’s Diamond Jubilee Medal. Dr. Ravalia and his wife Dianne have two sons, Adam and Mikhail. During his free time, he enjoys travelling, reading, and playing golf. There have been 34 appointments to the Senate made on the advice of Prime Minister Justin Trudeau. Since 2016, the selection process for Senators has been opened to allow all Canadians to apply. Candidate submissions are reviewed by the Independent Advisory Board for Senate Appointments, which provides the Prime Minister with recommendations. From the recommended pool of candidates, the Prime Minister selects the individuals he then recommends to the Governor General for appointment to the Senate. The Independent Advisory Board for Senate Appointments is guided by public, transparent, non-partisan, and merit-based criteria to identify highly qualified candidates.